Not just a Stash Note today but already a work in progress. I came across DelRay fabrics a few weeks ago thanks to the suggestion of Fiona. They had free shipping for a while which of course is a massive bonus when one orders from the US. Browsing around I found that they stocked a jelly role and yardage of the new x-mas collection "Countdown to Christmas" from the fantastic people of Sweetwater. I do love their collections and used the Pure collection recently to make my 'Laugh and Happiness. 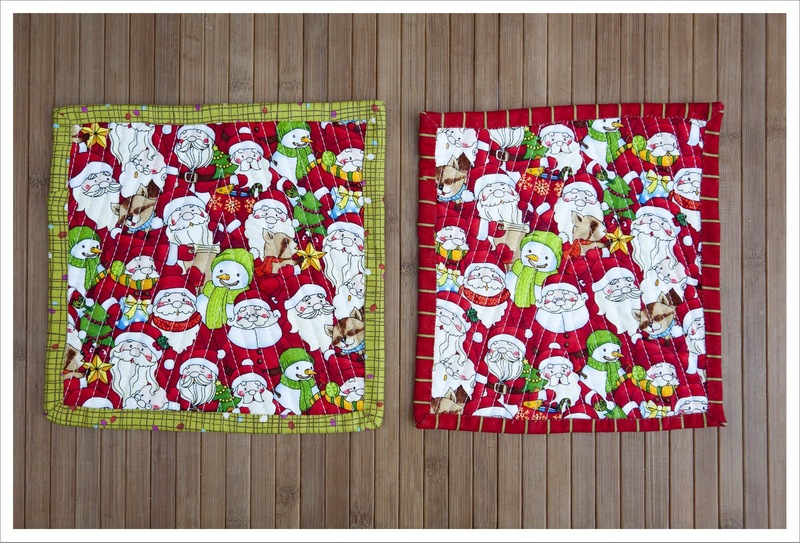 I think this is one of the cutest Christmas fabric collections around at the moment and I immediatly resovled to use it for a quilt with Christmas trees. I did a few test blocks to find the best size and came up with these two. They were all slightly to small (truth be told I messed up the mesurements of boths) so I made them into mini-mini quilts. 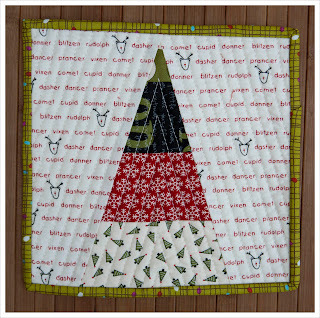 The instpiration came actually from a Sweetwater quilt for their new collection 'Hometown' which is meant to inspire a nautical theme but I kind of thought immideatly of Christmas trees. Isn't the background fabric the cutest ever ? 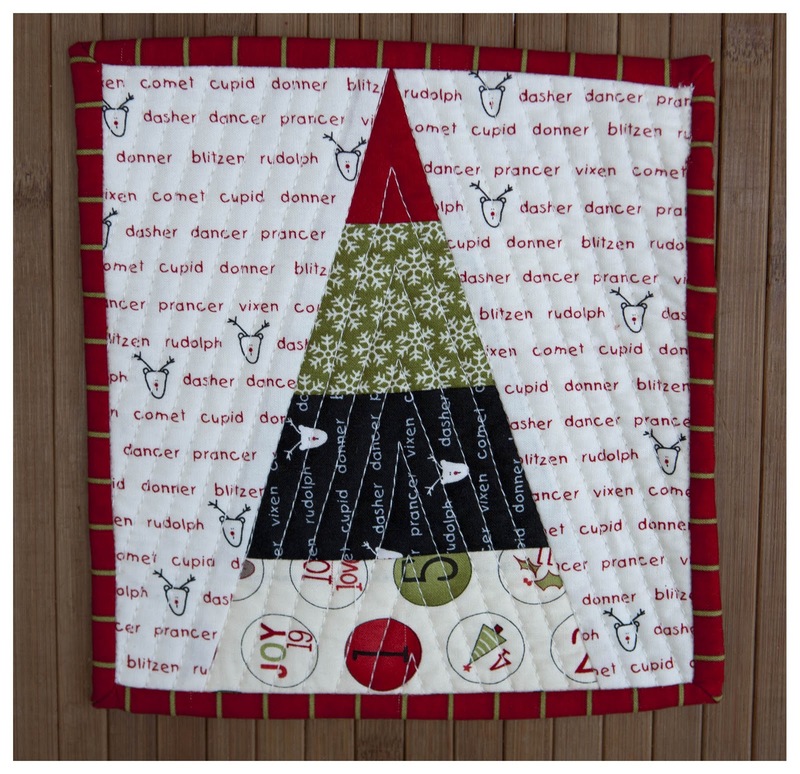 Backside of the mini-mini quilts. 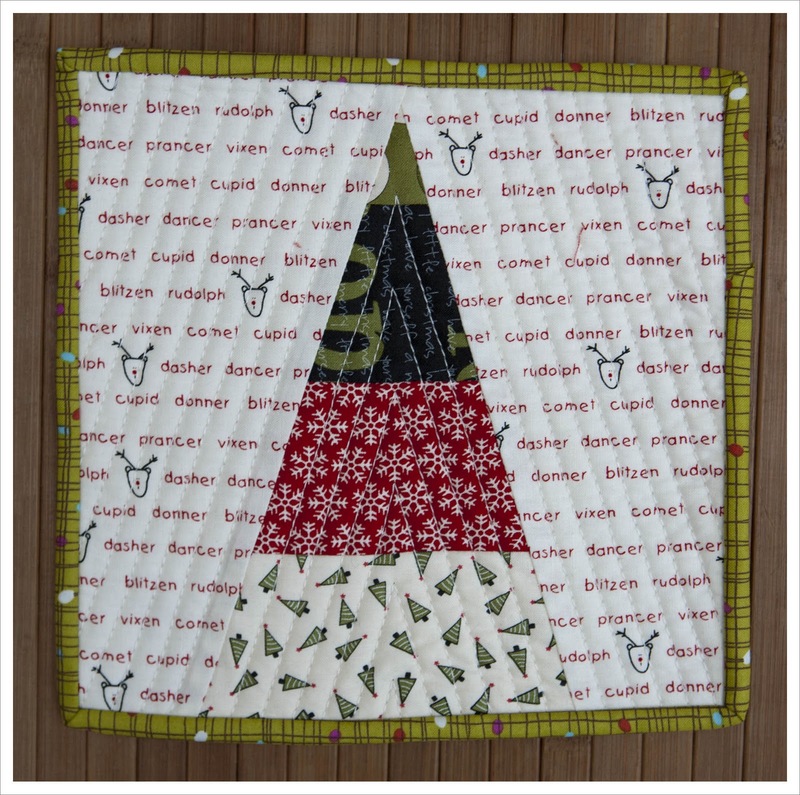 I have already cut all the pieces for the tree and started on the background fabric. The measurements are now for a 8 1/2 inch finished block to which I will add sashing in the red fabric. 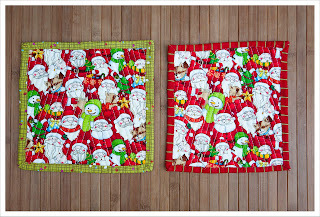 If anyone is intersted then I will post a pattern link for this block I am also almost tempted to propose an x-mas quilt along if people were interested but I am a little bit reluctant as there are so many quilt alongs around anyway and I have very little time at the moment. I would have time in the second half of October though. 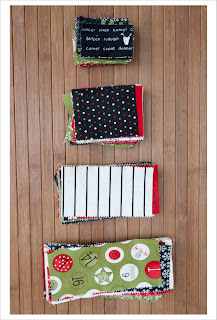 I love that collection too, and I love your mini mini quilts. I'd like the link to the block tutorial! Thanks. 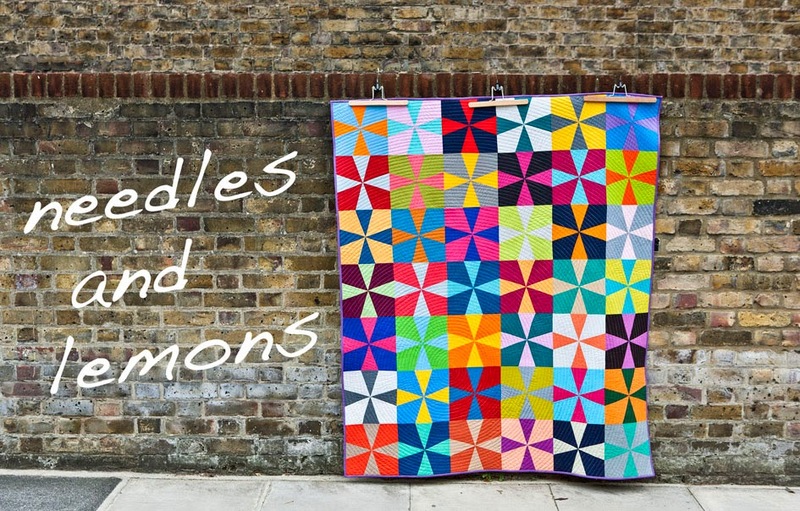 Lovely, lovely, fabric & blocks. Am also a fan of Sweetwater and used Pure recently. 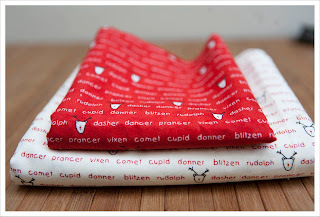 Cute mini and great fabric especially your background fabric! I love your stash notes, and I'm glad you got the free shipping! 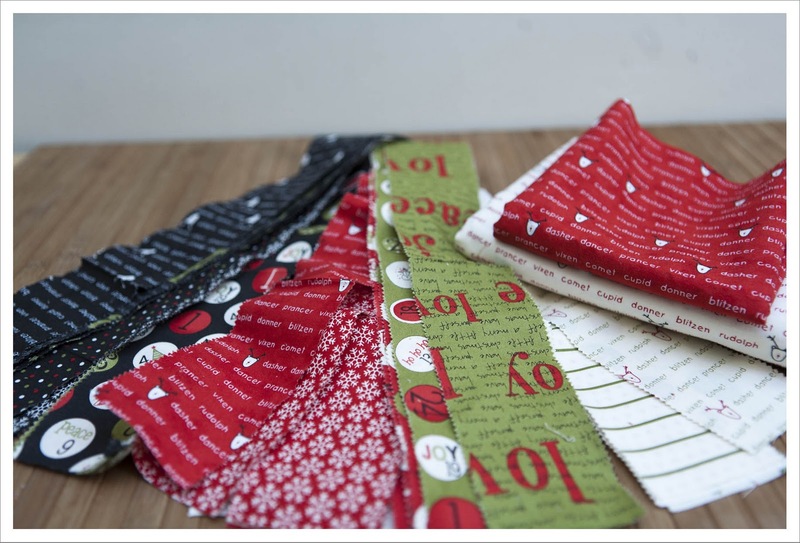 I'm trying NOT to buy that Countdown to Christmas fabric but now I've seen those gorgeous trees of yours I don't know if I can resist! 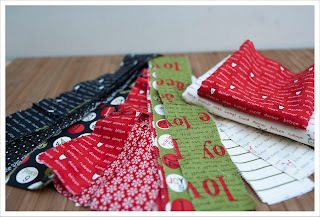 I just used my first jelly roll too - and you're right they are very messy with what I call "fabric dust". Cute blocks you've made with it! Love that collection too and I love your Christmas trees. 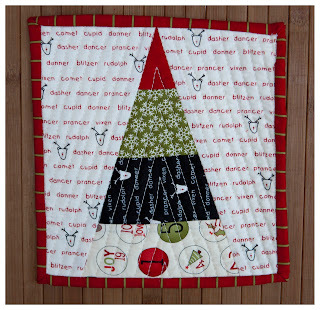 I try to make a different tree wall hanging every year and this just might be 2011's - and I may even be tempted into a quilt along!